Sometimes there are books that take you wholesale by surprise. Books that you didn't know anything about going into and are maybe even in a genre of which you're not typically a fan. Books that people think "Huh? Really?" when you recommend it to them. Tumor is not one of those cases for me. it is a book that I have been excited about ever since I first heard about it. It's a book that takes so many things that I rather enjoy and puts them together into one package that I will even go so far as to use the recently overused phrase "in my wheelhouse" in order to properly describe. 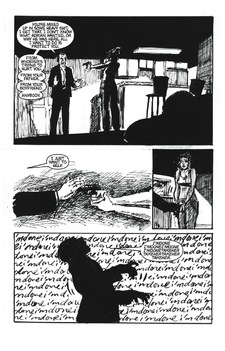 It's Noir, and it's Private Detective, and it's got gorgeously sketchy artwork, and it's more nightmarish than dreamlike but contains just enough of the ethereal ephemera of dreams-cape that it retains the kind of feel of Noir that I so enjoy (read my review of Area 10 if you're not familiar with what it takes to make a really great Noir story). Joshua Hale Fialkov brings a certain kind of magic to everything he works on (Having worked on Pilot Season: Cyblade [which won], Cyblade: Agent of Cyberdata, Pilot Season: Alibi [which did not win but is currently in development to be a feature film], Elk's Run [which was nominated for a Harvey Award], and also has contributed to the incredibly awesome anthologies "Postcards: True Stories That Never Happened" and "Outlaw Territory") and The Tumor is no exception. The book is really something special. And not just because it was one of the first comics to really make a splash on The Kindle, though that doesn't hurt it's status one iota. Archaia Studios Press took a chance by releasing the book in chapters for the Kindle starting back in August and it payed off in a big way, charting at the #1 digital download for several weeks and outpaced even some of the big hitters in the world of Graphic Novels ... like The Watchmen. The Tumor brings the story of Frank Armstrong, a private detective who has never really had much luck and never really had much of a desire to be a private detective. He's given a few scraps from a friend who is a detective with LAPD and makes a few bucks doing it. As the story begins he is suffering from some pretty blinding headaches and has been taking aspirin by the fistfull and downing them with anything handy. He's been given the briefest of details about a case that his friend Detective Polish wants to throw his way. Just that a girl is missing and that he can make a couple hundred bucks if he takes it off the police's plate. He quickly learns that the missing girl is the daughter of a prominent man in the criminal underworld and that there might have been a pretty good reason that she ran away in the first place. Just when Frank thinks he has a handle on the case and a lead worth following everything changes. Frank has an inoperable tumor in his brain that is causing him all kinds of problems and that has resulted in a skewed capacity to cope with the world around him. He is having vivid flashbacks to events that surround his late wife's murder and also to his taking of the case ... or perhaps they're flash forwards to his hospital stay and diagnosis. It's a haze of neuro-chemicals, stress, cranial pressure, mistaken identities, and regret. And it's all incredibly brilliantly told. Fialkov dances around the flashes with the grace of a ballerino (which is the male ballerina ... you probably didn't know that). The story has just as many twists and turns as Memento, Narcoleptic Sunday, Slaughterhouse 5, The Prestige, and other incredible non-linear styled stories. But there is a certain magic that Tumor brings to the page that makes it feel even more simultaneously human and unconscious. Noel Tuazon brings something like a sketchy Carla Speed McNeil to his pages and plays both the heavy inks of the shadows of the kind of stark story that Frank finds himself in, and the watered down washes of the memories and dreams he finds himself reliving with equal aplomb. The characters are emotive and pensive and human. You can see the dishonesty of Evelyn's eyes and the world weary wrinkles of Frank's face, the laziness and satisfaction of Polish's paunch ... every character is at once seemingly an everyman and very specific. They are people you've known, strangers on the street. And Fialkov writes them in the same fashion. They have favorite restaurants (not to mention favorite dishes as those restaurants) and grandparents who lived in this neighborhood years ago and an awareness of the miasma that is Los Angeles, an amorphous city that resists definition and defies stagnancy. They embrace the multicultural melting pot that's become more of a cesspool than anything else and they do so without hesitation. There is something immediately appealing about these characters. Fialkov has penned an incredible story here and it's really in the intimate little corners of the story and the commentary about the city he calls home that the narrative really sings. When Frank is at his lowest is when you understand him the most, when Evelyn is at her most aghast you identify with her, when the circumstances of the case that Frank is working now and the situation that resulted in the death of his wife is the most similar you start to see the beauty of the piece. Do I think that it's success online means that it is the future of the way comics should be communicated to it's audience? No. As much I enjoyed reading it on the screen of my computer and later on the surface of my roommate's Kindle I more thoroughly enjoyed the reading of it in the gorgeous package that is the hardcover. With it's Deckle Edged pages (that's the rough, uneven cut to the pages that a lot of hardcover books in the literary industry have started to take on and dates back ... well that's for another time), it's half dust jacket revealing the embossed cover image of Frank's brain, the "Frank Armstrong Mystery" short story in the back, the original pitch material (including original character sketches), the essay about the Los Angeles of The Tumor, and the Afterword written by Fialkov I think that it makes for an incredible package that is more than worth it's price tag at $14.95. I think that fans of Criminal, Parker: The Hunter, Sleeper, Queen & Country, Scalped, and all great crime fiction will more than enjoy this book. 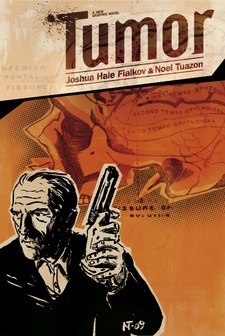 Tumor - The Trailer from Joshua Fialkov on Vimeo.